It's very nice to get confirmation for giving money for garbage phone. Like they say in article, only the name is what these phones share with old Nokia. These are generic China phones. You'll agree on that part just because an article says that? You should just compare the built, service and the updates program with any other Chinese brand and you will have your answer. FIH Mobile is indeed also helping others get started by doing the majority of the stuff for them. 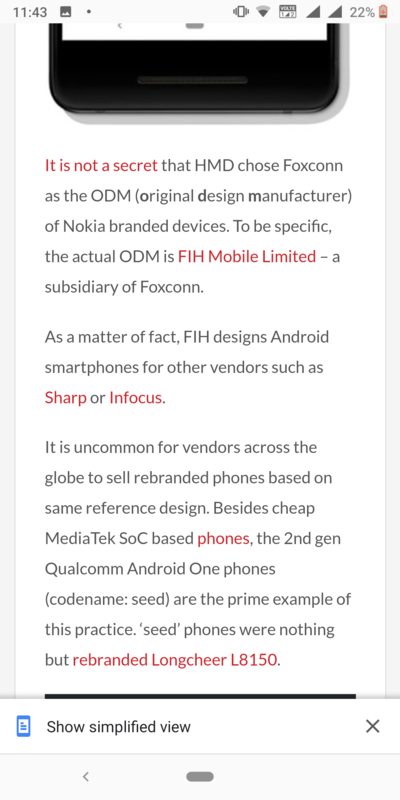 Same is going on for HMD wherein HMD does the design, the manufacturing, supplies and software party is outsourced to FIH Mobile. 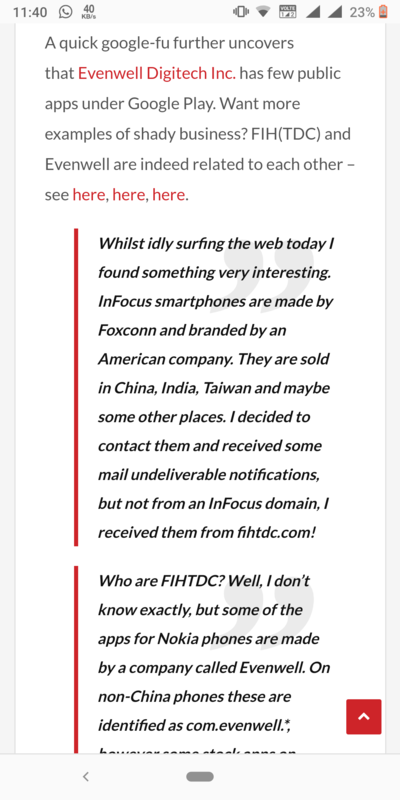 BTW, FIH also does a lot for Google's Pixel phones and Apple's iPhones. HMD is still new. You cannot grow up in one day and start doing everything yourself. HMD is expanding; they now have an R&D center in China. And you'll see more from them in the future. FIH Mobile is their platform to get started. As the revenues flow, they will do more to bring back the legacy of old Nokia. Good to hear some positives about FIH. I have disabled a lot of evenwell junk on my 7+ and i dont see any negative effects (battery & performance). Though the phone has become a lot snappier. I do not understand why an android one device has so many system applications from evenwell. Where android one devices strongly insist on bloatware free experience. If you compare with other android one phone vendors (Mi , Motorola...), HMD has lot more extra system applications. Most of them are focused on background application monitoring to conserve the battery life and also some collect telemetery information and upload to HMD servers. The above link shared also talks about the same bloatfree android one experience. You'll agree on that part just because an article says that? You should just compare the built, service and the updates program with any other Chinese brand and you will have your answer. I agree because of how I "feel" when I'm using my 7+. This is my first and only phone with problems and that negative experience of using from day one! And this one is best of all of them if you look specifications. I own it for a month and yesterday I've switched back to my old Motorola g5s plus because it is much better phone. Everything works. I don't have to click two or three times until my phone decide to do what I want. This is first time I've experienced or heard about unresponsive part of the screen and since it is generic phone I don't expect fix any time soon. If I'm not mistaking this problem exists for months. Charging port is so bad and I can't say I feel comfortable because I expect it will give up at any time. Plus stupid feeling I can't answer a call if phone is connected to charger because I could break connector. This problem I wouldn't expect even on cheapest generic phones from China. Lowest brightness of screen is horrible. I live in country where in winter time we have only about 5 or 6 hours of day light and having this bright screen is painful for eyes. Also I never had that problem before. One very important thing for me is earpiece sound which sounds not so clear and it is happening many times that I don't understand other side. It's very annoying. I'm generation who is still using phones for phone calls so this is very important thing and big issue for me. I have experienced not getting notification for sms, sound nor visual. I've seen that sms three days later in my messages. That also never happened with any other phone before. Bloatware for android one device was really unexpected. I've disabled all evenwell apps and since then phone feels snappier, but still it's not working good enough. Motorola g5s plus with snapdragon 625 works much better. So, considering all this, my opinion is not based only on some online article. It is very bad experience of using this phone and it is quite big waste of money. 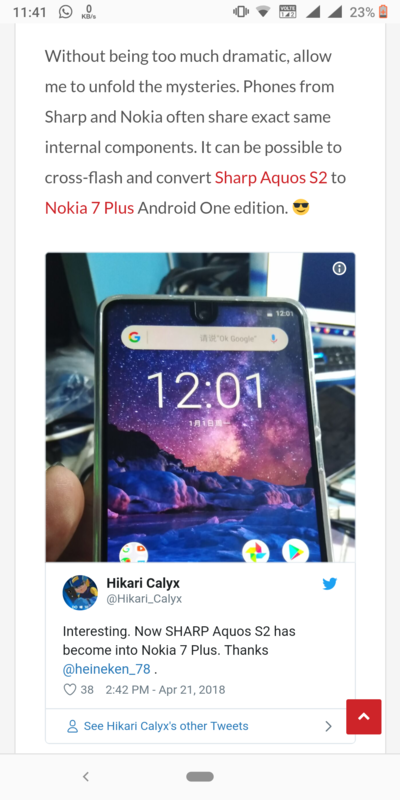 Article is only telling me that this phone is produced by some company and Nokia sticker is just few letters on it. I don't think Nokia is doing any design of anything. They just get list of specifications and they decide name of model and that's it. Lastly features like face unlock...the patent got rejected...i dont know what a competition killer biometric authentication are they going to use to have a patent for it...they dont even have dedicated infrared camera or sensors on any of its models to have a secure Face Unlock....they promised to give face unlock last year to Nokia 7, 8 and Sirocco...but neither of these phones have any dedicated hardware for it...so what's the patent for anyways? @vibhor sometimes what you see as useless isn't always useless. Other than the overlays (most of them are overlays and won't impact performance by a noticeable degree), there are only a few main apps. The powersaver is one (you know about that, the well criticized background killer. I have a different opinion about it though) , the battery protection is other (gets thermal details and stops charging or shuts down device based on the device temperature), there's one for testing the device hardware and functions, there's BBOX too (*#*#227#*#* menu, I find it very useful to get the software version), then yes telemetery data (stability monitor *#*#277#*#* and all inclusive). I find all of these very useful for taking care of the device and for service requirements. There's honestly more bloat that Google injects in these phones and nobody has a problem. 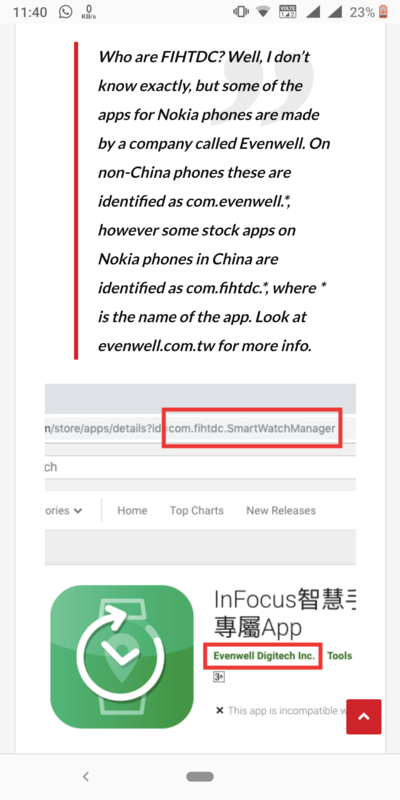 The only problem people have is when HMD's outsourced partner evenwell adds some apps. Had Nokia/HMD developed those, it would have been okay, isn't it? I'll try to dig more into the Xiaomi's Android One system image and see what all they include in their OS. @prasad134 i am happy cause at least some people talking truth , not talking like a nokia fanboy. And this article is really interesting. Nokia did nothing innovative after its comeback. They are just using their old patents and licenced features. This is just because these nokia phones are rebranded phones by chinese odms and nothing else. 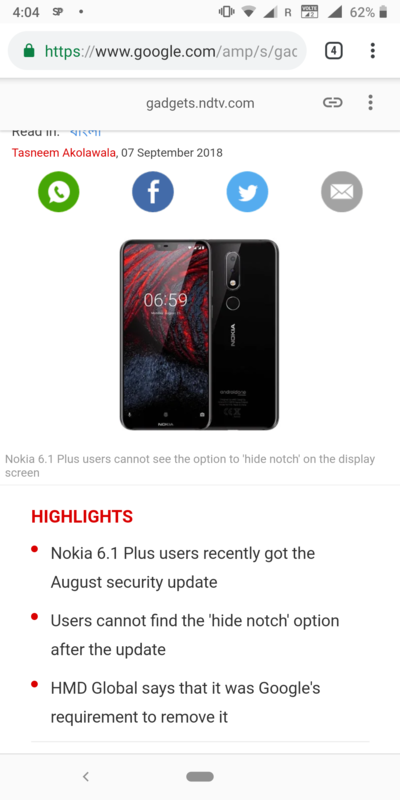 Lastly features like face unlock...the patent got rejected...i dont know what a competitiin killer biometric authentication are they going to use to have a patent for it...they dont even have dedication infrared camera or sensors on any of its models to have a secure Face Unlock....they promised to give face unlock last year to Nokia 7, 8 and Sirocco...but neither of these phones have dedicated hardware for it...so whats the patents for? Thanks to @wilson shrestha for the pointer to this chat about Evenwell software etc. First, most of what that article says is not a surprise, I think it's poor journalism to write it as "news". Some of the things written in that article are not a surprise and honestly not worth mentioning, e.g. someone is a director of several linked companies. Surprise? No, check out Richard Branson and Virgin for example. 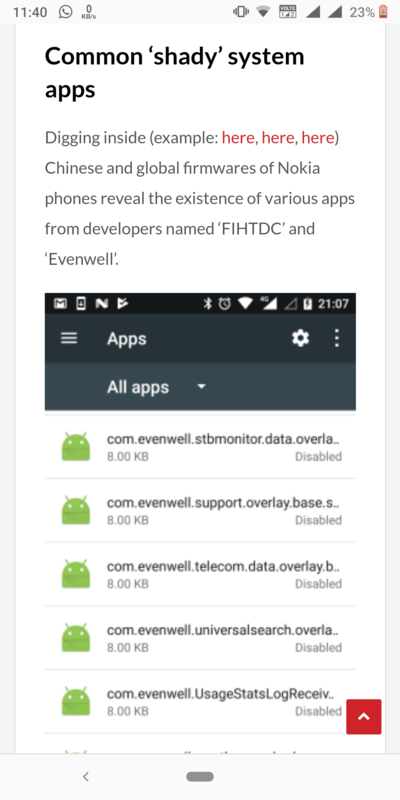 Regarding Evenwell etc, It's true that HMD could not develop all capabilities immediately and FIH Mobile already have a capable software integrator in Evenwell, which is why they provide so much of the system software. 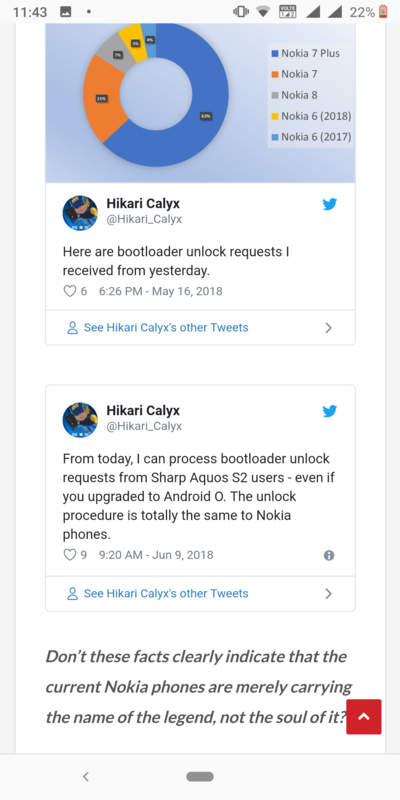 I agree with @singhnsk that most of the system software is actually for the benefit of the phone, although I don't understand it all as well as him, it's clear to me that some of this software could be better! Obviously we're not 100% happy with the quality of the software and I hope that this is something which HMD are pressing FIH/Evenwell hard to improve. 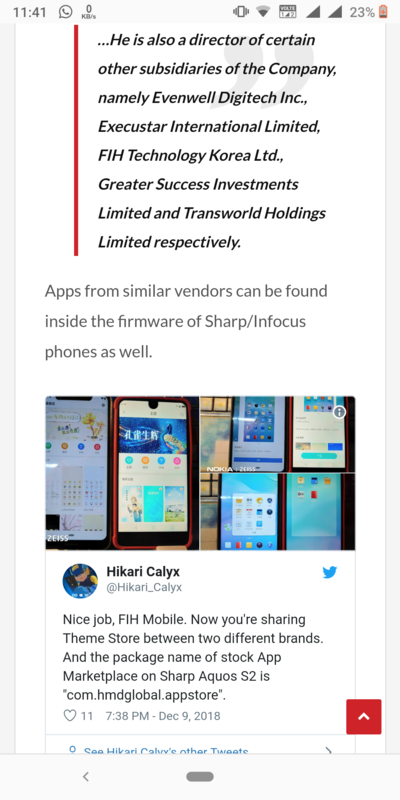 The tweet from Hikari Calyx about the app store being common between Sharp and HMD phones is more interesting, as from the app name it's clear that HMD made this, not Evenwell. I wonder if HMD knew about this?! 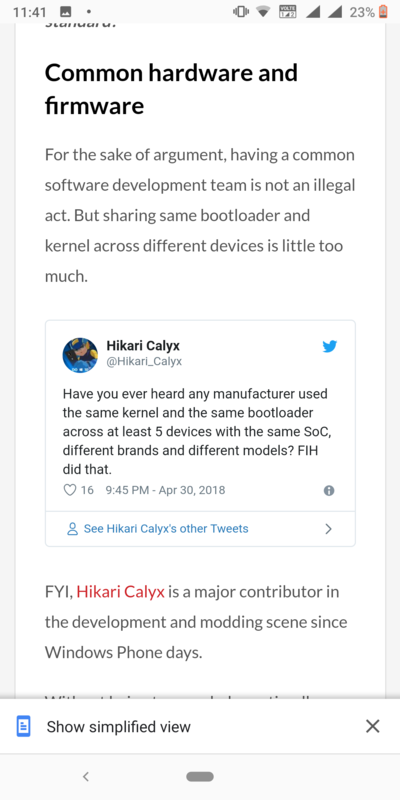 However, sharing the same kernel and bootloader across several devices makes a lot of sense, I don't know why Hikari Calyx is questioning it. This is how Windows computers have been for decades! It's much more efficient and should mean that there are less bugs overall. One of the "holy grails" of Android devices is to get them all running on the same, mainline Linux kernel. As for bootloader unlocking, I have a suspicion that one condition for Android One is that the bootloader is not unlocked. I could very easily be wrong about this though. @prasad134 I'll make a small clarification on "face unlock" - HMD did not have a patent rejected, only a trademark application. The rejection just means they cannot claim that "Face Unlock" is an HMD trademark, it does not indicate anything about the novelty or capabilities of any algorithms/technology they have. Personally I think the trademark rejection was a good thing because "Face Unlock" is a very generic term, just like "swipe" and "pinch" when refering to gestures on a touchscreen. AFAIK, to me, Android One means pure Android experience. So NOKIA camera is a necessary app. I would like to know what such unique features which are not accessible by the bundled apps in android one, are being brought out by Evenwell apps. Is Android One not feature complete ? I mean I understand some of the Evenwell apps are there to provide information for the lock screen and such. Google even has an app for notches. 3rd party phones with notches needn't use their own apps to compensate for notches. Likewise many of the basic overlays and information provider apps might have also been there in the Android One package which NOKIA has removed and went with Evenwell. Do you think Google won't provide apps for overlays and information providers ? Is Android Power management inferior to Evenwell power management ? Why is there a need for a third party power management app when Android itself advertises great power management. I can point to several sources where users have reported significant improvement in batte life by disabling or removing the Evenwell power management app. @Daniel G M Exactly my point of this discussion...Google's own bundled power management is far better...why to bundle apps like Evenwell which actually degrade the battery performance and disabling them improves the battery life? So why bundling them in the first place under Android One? Check this screenshot below...HMD removed hide notch option in Nokia 6.1 Plus...saying it was a Google requirement...so does Google tell HMD to bundle bloatware like Evenwell for degrading the battery life? Isn't it a Google requirement to not put bloatware into the Android One phones? Also...they aren't giving Face Unlock...would be Google's Native restrictions to the system...which are to be changed in Android Q...so Google doesn't restrict 3rd party apps like Evenwell to be bundled in Android One program? Is that allowed in Android One program? Very well put. I exactly have the same concren. Why HMD need to bundle such system apps , if most have them are already part of core android OS ? Never saw any other android one vendor (eg. MI A1) bundling explicit power management apps. I could not find any proper justification behind evenwell system apps , though there are more criticised. Here's my understanding about "pure android", "Android One" and how the Android software gets onto the HMD phones. "Pure Android" should be considered to the the AOSP project which Google releases the source code for with each new version of Android. It doesn't contain any of Google's proprietary apps, or "Gapps" as they're known. "Android One" is the name of a Google-run certification programme for devices which it believes showcase the best of Android to prospective customers - Android as Google want customers to receive it. It can be considered AOSP+GApps+manufacturers customisations. The manufacturer customisations have to be approved by Google as part of the Android One certification. Therefore, any Evenwell, FIHTDC, HMD Global or even Code Aurora, Qualcomm or Mediatek software which is on an Android One phone has been agreed by Google - Google are happy that it is there and it is acceptable as part of the Android One experience. To go into even more detail, the AOSP software is not the finished product, especially for system apps. It requires adapting to the hardware on which it will run. When it is adapted, my understanding is that the name of the application changes to the organisation which adapted it. This is where the Evenwell, FIHTDC, Code Aurora, etc applications come from. There are probably some of these which are not from AOSP, but added by the software integrator (Evenwell) for hardware performance issues, but I doubt that there are many of them. Now, I've just noticed some overlays in my systems apps called com.nbc. * - I don't know who makes these, any ideas? Therefore, any Evenwell, FIHTDC, HMD Global or even Code Aurora, Qualcomm or Mediatek software which is on an Android One phone has been agreed by Google - Google are happy that it is there and it is acceptable as part of the Android One experience. But what if it is ruining the software experience ? And we are getting a better experience without it ? Talking about the power saver app here. Good question, but you could ask the same question about any Android phone (any computer, smartphone, tablet, wearable... Etc). How google certifies and aproves android one builds of HMD , when customers have already complained about killing of background apps which is a major issue and not the intended behaviour of pie. By the way i have disabled almost 70% of the apps from the above list and the device is running flawlessely without any impact on battery since past 2 months. Well some of these apps really have a purpose. This is one factor which differentiates "android one" devices from "pure android" devices. The other one is the gauranteed monthly security update and 2 future versions of android releases. If my understanding is incorrect then may be only the second point is the differentiating factor and the vendor is still allowed to bundle bloatware in an android one device (which they generally don't and HMD here is an exception). Regarding other Android One phones, they do exist, so could be compared against. Mi A1 has very few bloatware system apps compared to HMD. We all need an official statement from HMD. Every statement we do about evenwell apps need to be clarified from HMD. It's obvious that Google acknowledge HMD and its partners to add this kind of software modules to its official Android distribution. Android One, No bloatware my a**e ! 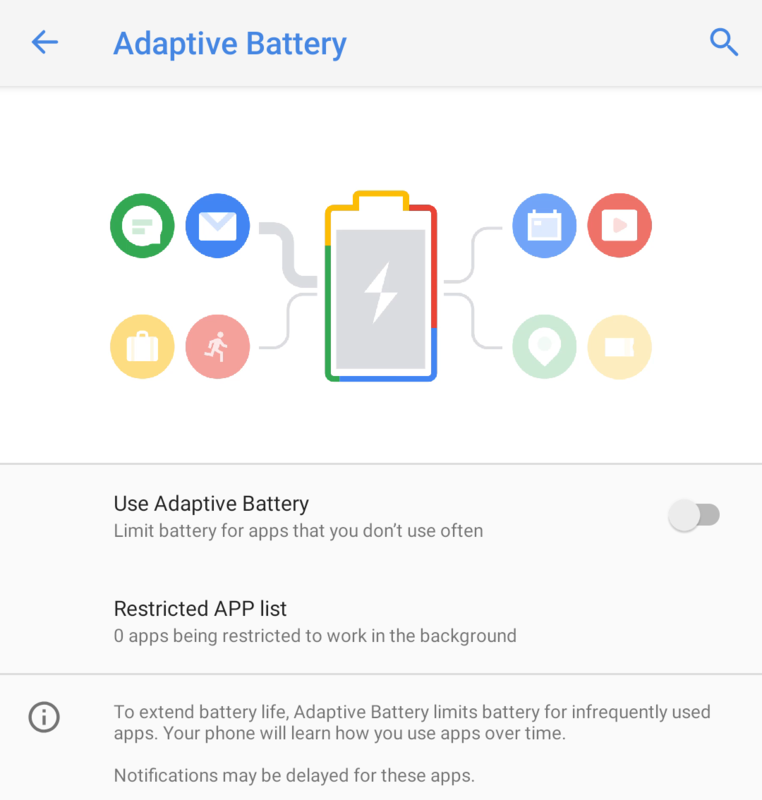 I don't have my adaptive battery turned on. I have not restricted any apps as well. Still my music player is being killed by another power saver app which I don't have any control over. This is f**king bloat ! The phone you can rely on is bending you over and f**king you in the a**e.
That's how reliable this piece of s**t is. 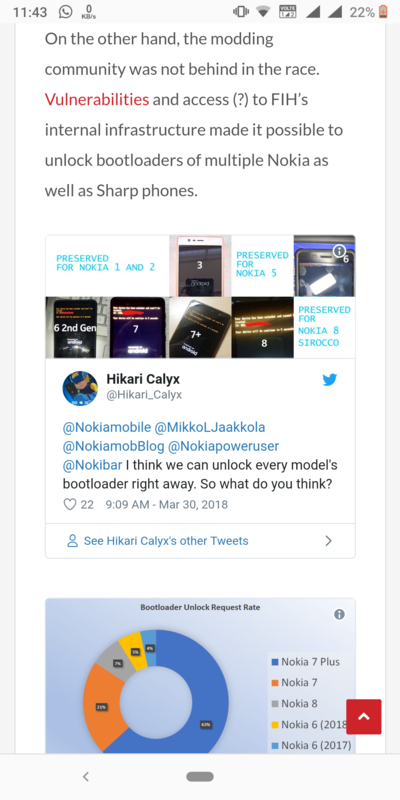 HMD/Nokia you better remove Evenwell s**t from my phone because I never signed up for this in the first place. No, I will not use ADB and remove it. I bought my phone paying full price, and I expected a fully functional phone. I don't want to waste my time tinkering with the internals. I for myself have spoken out. 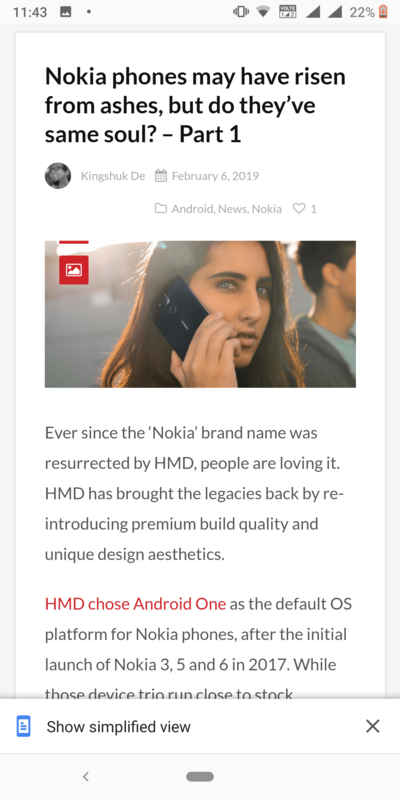 HMD is selling crap under the name of android one.They got the worst score on dontkillmyapp. This is again a big question to google on how they certify and approve android one builds from HMD. I uninstalled 4 apps (through ADB) that make the phone sluggish and unusable. The effect was immediate. The phone was a lot snappier. 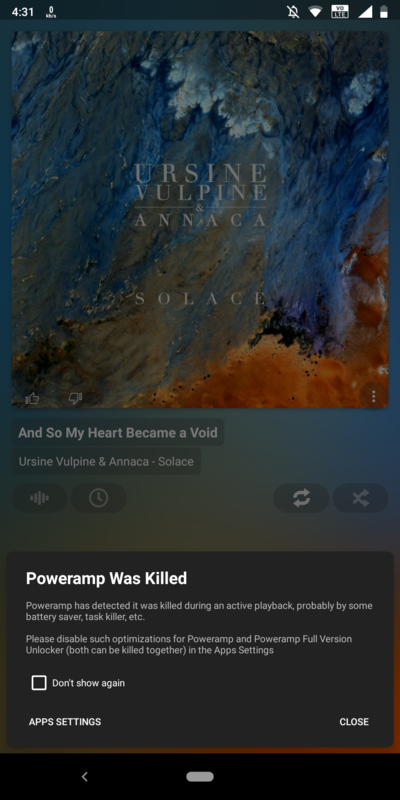 However after restart, I saw that the built in android adaptive battery was turned on and along with a bunch of other apps, Poweramp was in the list. I had never turned on adaptive battery in the first place. 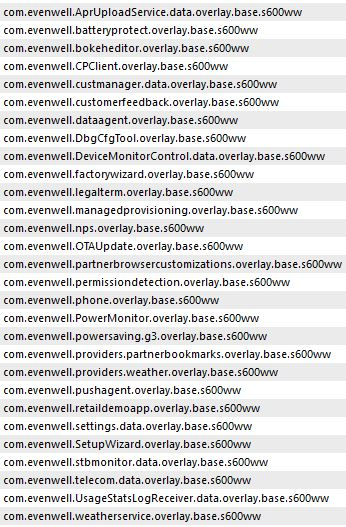 So my best guess is that the Evenwell power monitoring and power saving apps worked behind the android adaptive battery, creating a list of apps with high battery usage. Even if you have adaptive battery turned off, the Evenwell app force closes and restricts apps aggressively. I also have a strong feeling that these apps are somehow linked to controlling the clockspeeds of processor as well. Because when I uninstalled, the phone felt very much snappier and fluid. Do share your feedback whether a snappier phone also translate to higher battery consumption. I have already disabled the packages you mentioned above but my phone already seemed snappier due to custom launcher. Also, does Adaptive battery always turns on after restart? If thatst the case, then add one app under Restricted app list. It wont turn on by default. Thanks to @AniketThakur for telling this. I had disabled these but my phone was getting warm much faster than before and battery was reduced by ½hr. But the phone was more fluid. Exactly... I believe these respective Evenwell apps act as trade-o between performance and battery life. I have shared the battery stats in on of the posts. My phone has 70% of the evenwell **** disabled. Phone is working to its peak potential now.